One of the main reasons I read fiction is curiosity about my fellow humans. ‘Go, Went, Gone” tells the story of Richard, a retired, widowed professor in Berlin, who discovers a whole new world of people outside his door. Near his home, he discovers a group of African refugees, all of them men, who are protesting their treatment by the German authorities. These refugees are treated by German society in general as nothing more than a problem and to be ignored unless and until they cause any disturbances. They are moved from school building to office building to warehouse. In German society where work is so important, these African refugee men are not allowed to work, not even to wash dishes. That is one of these men’s biggest complaints, that they have nothing to do all day long. Some of them were skilled metalworkers in Libya or Niger or elsewhere, and others had different jobs. Richard gives these black men who are stranded in Germany with no place else to go the most important gift anyone can give them, an interest in their lives. He listens to their stories of their harrowing times while still in Africa. Many of these men had led relatively comfortable lives when suddenly all was upset by unrest and violence. They were forced onto unseaworthy boats, and for one man, Rashid, he watched both his children drown when the boat capsized. Rashid escaped. The Germans tend to treat the disruptions in these men’s lives as something totally foreign outside of themselves, completely forgetting all the disruptions to Germans resulting from World War II and the division of Germany afterward. Richard lived in the Eastern sector of Berlin and recalls how he was treated as a second-class citizen when Germany was reunited. Some writers go overboard with special effects to win over their readers. Instead Jenny Erpenbeck is one writer, like perhaps J. M Coetzee, who is confident enough in her technique that she remains resolutely unflashy and austere in presenting her story here. Also the lives of these refugees are necessarily plain and austere as they are prevented from doing anything useful and are moved around from building to building. Perhaps the story Erpenbeck is telling here is so important it goes beyond artifice. “Go, Went, Gone” is not a fun or happy read, but the world is not always a fun or happy place. In the final Acknowledgements section, Jenny Erpenbeck expresses her deep gratitude to the thirteen African refugees she had many good conversations with. It shows in her writing. Well, this is timely. On Monday I watched a chilling Four Corners report about the rise of the far right in Germany and how they have been empowered by a general hostility to refugees. But at the same time, the program acknowledged that a year after the arrival of about a million refugees in Germany, the overwhelming majority are working, have settled in well and are not made to feel unwelcome. (Of course, as we know in Australia, we can argue about what ‘settled in well’ might mean). But my point is this: in the time between an author first taking an interest and the publication of the book, an awful lot can change, and that includes both the refugees’ first impressions and the reaction of their unprepared hosts. So I think the refugee crisis is much more complex than this book might suggest, even though it’s coming from a good place. ‘Go, Went, Gone’ was originally published in German in 2013, so four years have passed. It could even be that the novel helped improve the way the refugees were received since then. The novel was written in an earlier stage of the situation. At that time the Germans probably were unprepared hosts. I used to work for a major company as a computer programmer, and the company brought in hundreds of programmers from India until the programmers from India outnumbered the Americans. But that was a totally different situation because the people from India were highly educated, spoke very good English, and were extremely polite. Still they appreciated Americans who went out of their way to be friendly to them. There are always politicians who will use hatred to advance their careers, but so far Germany hasn’t been dumb enough to put them in leadership positions which has happened in other countries unfortunately. I’m pleased to read your positive review (I think a few people didn’t like it quite as much as her more operatic novels like End of Days). Jenny Erpenbeck was in town a few weeks back and I saw her on two panels—one of which was more political where she was the only novelist—and had an opportunity to visit with her. This is one of my must-reads for German Lit Month. 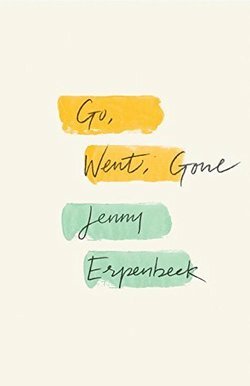 ‘Go, Went, Gone’ is the first novel of Jenny Erpenbeck that I have read, so I didn’t know what to expect. I do like that she is confronting an important subject of today in individual personal terms. We’ve had enough novels dealing with upper middle class suburban angst. ‘Go, Went, Gone’ will fit in well with the German Lit Month.